Mr Bru Cru: Back To Old Ways. As if the sneaker world isn't crazy enough as it is, Nike has decided to shake things up a bit more. Back in the good old days, when I couldn't afford sneakers, Nike was branding Jordan's with their signature "Swoosh" logo beneath their name. As time went on, It eventually went away and we started seeing The Jumpman Logo on most if not All Air Jordan Models. Obviously to me this doesn't really bother me nor does this affect me in any way. Now, I know a lot of long time sneaker heads and a lot of hype beasts who will want to get their hands on a pair of these. 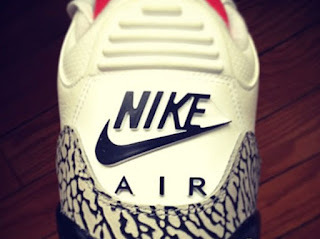 It is rumored that Nike will release the 1988 version of the Air Jordan White Cement 3's (As pictured above). Here is more From Sneakernews. This special release will in fact come with a nice commemorative back-story, with Jordan’s 1988 Slam Dunk Contest win possibly at focus (perhaps a February release). Is this a sign of things to come? Will Nike Air make a return with more AJ3 original colorways, as well as the IV, V, and VI? ".